The Alps stretch all the way from Southern France right across to Slovenia. They are the biggest and most significant linked group of mountains in Central Europe. Because of the varying temperatures across the ranges, they are home to a wide variety of animal and plant species some of which are completely unique to these mountain regions, like the Chamois, and some that have been reintroduced, like the European Brown Bear. The Italian Alps, where I am currently based, are home to a plethora of wildlife and it is a humbling privilege to share the landscape with them. It is not uncommon to catch glimpses of some fascinating alpine animals if you are in the right place and are respectful of the animals you are observing. Whilst there are many species to appreciate, there are concerns that changes in the landscape as a result of climate change, modern agriculture, urban sprawl and mass tourism are having a negative impact on the wildlife of the region. There have also been some attempts to reintroduce species that have been extremely controversial, dividing local communities. What Alpine Animals can you expect to see in the area? This is a much larger ungulate than the Chamois. This mountain goat can be trickier to spot as they tend to stick to higher ground. They are easy to identify due to their prominent, large and ridged horns. They can often be spotted on cliff ledges, out of reach of hungry predators. 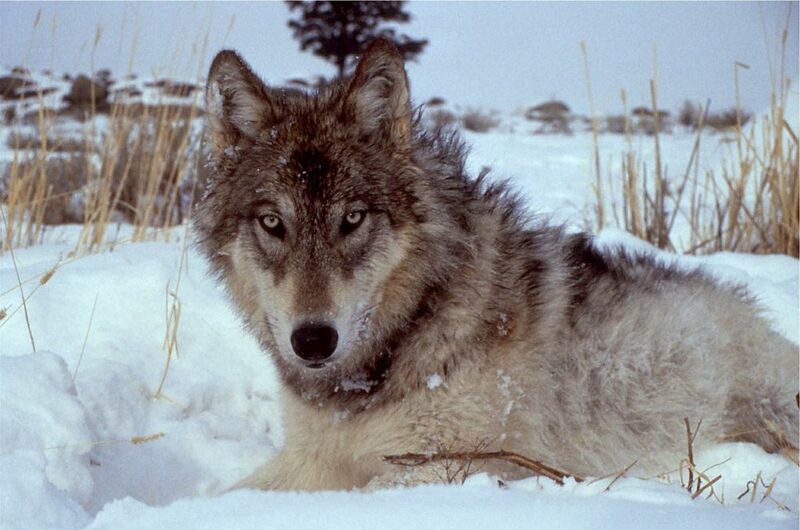 Hunted almost to extinction in the 19th century, they now have protected status and their numbers have thrived. I haven’t been lucky enough to see any of these adorable little critters yet but I did hear their distinctive alarm call, a series of loud whistles, on a number of occasions during the summer, probably alerting the rest of their family that Annie and I were around. They are proficient diggers which allows them to create dens in even the hardest frozen soil. Whilst they are from the squirrel family they are not tree climbers and families live in a series of, often complex, underground burrows. Part of the reason I have perhaps not been lucky enough to see a Marmot yet is that they can hibernate for up to 9 months of the year. They are most visible in the Spring during their breeding season. 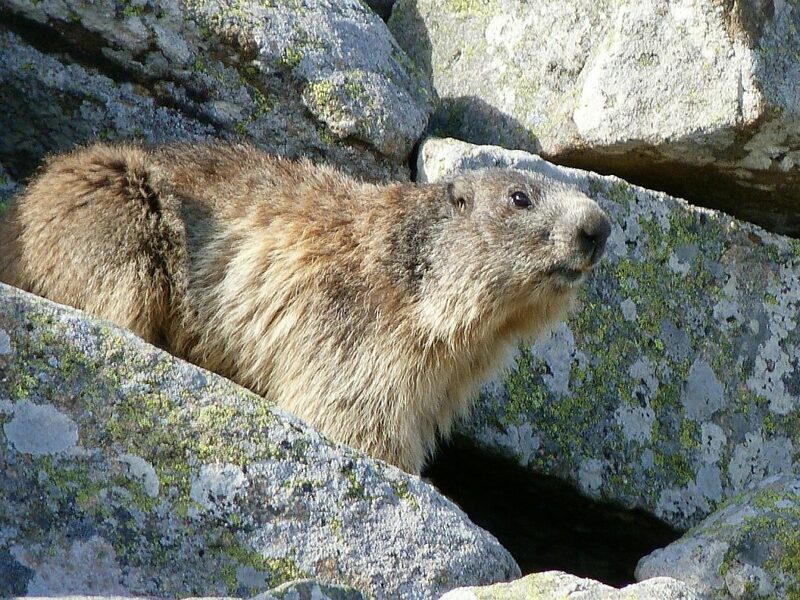 The Alpine Marmot is one of the most popular Alpine Animals but it can only be seen at certain times of the year as it hibernates for up to 9 months! Whilst some of these are more elusive than others the Italian Alps plays host to, amongst other species: Wolves, Brown Bears, the successfully reintroduced Eurasian Lynx, Golden Eagles, Bearded Vultures, Ptarmigan, Mouflon (a species of Wild Sheep), Pika (a cousin of the rabbit but with shorter ears), Squirrels (they are very dark brown in this region), Brown Hare, Red Deer and Wild Boar. There are a host of snakes and lizards that make an appearance in the warmer months too. Sightings of impressive Birds of Prey are not uncommon in the Alps. 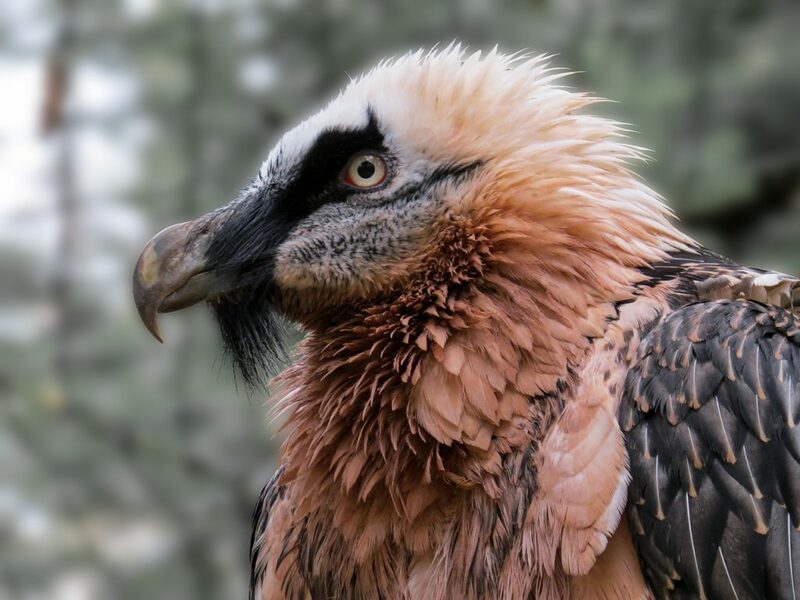 The Bearded Vulture can be recognised by its huge wingspan – up to 2 meters long! Unless you are with a wildlife expert it is unlikely that you will cross paths with a wolf but, they are making a resurgence in the Italian Alps after being hunted almost to extinction in the early part of the 20th century. Since 1971 they have been granted protected status in Italy and their increase in population is being heralded as a good example of a conservation success. If you are walking in snowy conditions and you suddenly spot paw prints you wish to identify, wolf prints are very large and they are always in a straight line rather than in the pairs of prints that are left by dogs. In recent years there has been growing discontent amongst some, particularly farmers and hunters, within local communities in areas that wolf populations are growing. This has meant that proposals to introduce culling schemes have been put forward and there is great strength of feeling on either side of the debate. In 2016 France did implement a culling initiative which caused much debate on both sides of the fence. The arguments in favour of culling are that it helps to reduce any possible conflict between wolves and humans, helps to pacify the public, ensures the growing population does not get out of control and minimises the growth in wolf-dog crossbreeds. Most importantly it is argued that it will reduce the risk to livestock sharing the region. Conservationists argue, however, that Herd Management techniques are much more effective in terms of protecting livestock as seen in this report from the European Wilderness Society and that we need to learn to coexist with a species that has as much right to be here as we do. They also argue that predators like wolves help to control the population of other species that can cause problematic damage to the environment if their numbers get out of control. It is a tricky balance and one that continues to boil on. As reported by the Telegraph in 2018, farmers in the mountainous regions of Northern Italy have also been concerned about the dramatic rise in red deer numbers. Whilst there is an argument that wolves will naturally help to control this population explosion, the farmers argue that the deer eat the feed supplied for livestock, a problem in itself, and they actually attract wolves towards the grazing areas, which can then result in further livestock being attacked. Government Authorised culling is not uncommon for the deer in these areas. There was once a thriving population of Brown Bears in the Alps but, by the late 20th century there were only a few bears left in the whole of the region. As a result of this, the Life Ursus project was launched to try to reintroduce brown bears within the Alps. The biggest challenge the project has faced has been the perceived threat bears pose to local communities and tourists. There has been a large backlash to the project and work is still ongoing to change public perception and promote acceptance and a harmonious living arrangement. 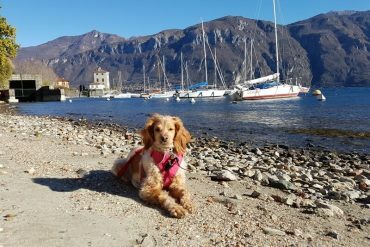 As reported by the BBC, in 2017 the Trentino Government shot and killed a 14 year old female brown bear after she attacked and seriously injured an individual out walking his dog. It is believed the attack may have been because she perceived a threat to her cubs. It was not known if the cubs were able to survive without their mother. There was also an attack in 2014 that resulted in the Bear, Davina, being tranquilised to allow her to be relocated. Unfortunately, Davina died as a result of the procedure and left behind two cubs, although it is believed that the Cubs have survived. Whilst it is extremely unlikely that you will come across a Bear on your adventures, if you do the advice is not to panic, don’t make any sudden movements and, most importantly, do not run. Most Bears will be as keen to avoid any sort of confrontation as you will. Bears are incredibly fast and expert climbers so trying to outrun them or escape to the safety of a tree is not a good plan. The best tactic is to speak in a gentle and appeasing voice and to slowly back away. Bears often do a bluff charge . If the bear follows you them stop and stand your ground. In the very unlikely event that the bear does keep charging then quickly lie on the ground, face down, covering your neck and head with your hands as best possible and then play dead. Often the bear is only trying to get rid of threat (perhaps it has cubs or is protecting a food source). If the bear does then leave you, don’t get up immediately. It is recommended that you stay down for at least twenty minutes to ensure the bear is not lingering to ensure that you are dead. 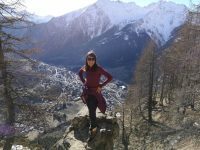 There is growing evidence showing climate change is having an impact on the wildlife in the Alps. The landscape is becoming more fragile as a result of the retreating glaciers and shifting permafrost. This means that there are increased rockfalls and avalanches and the terrain is becoming more vulnerable, resulting in the destruction of habitat and feeding grounds for certain species. The National Oceanic and Atmospheric Administration reported that ten of the hottest years to ever be recorded have occurred in the last twenty years and this hike in temperatures is starting to show it is impacting alpine animals. 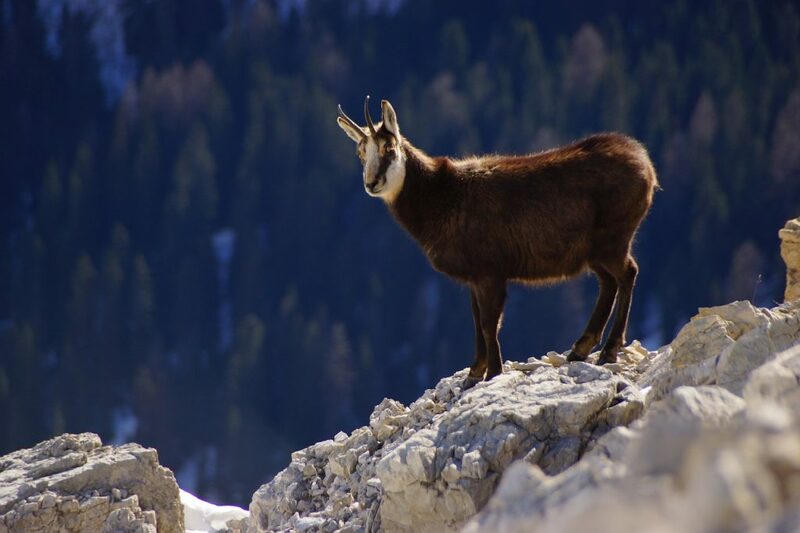 In 2014, Frontiers in Zoology published a report that documented the dramatic decline in the body size of the Chamois across the Alps in recent decades and this was attributed to Climate Change. On average, yearling Chamois weigh around 25% less than they did just 30 years ago. After studying habitat, food sources and behaviour the Scientists concluded that this drop has come as a result of the Chamois spending more time resting and less time foraging for food during the hottest temperatures so they are not growing as much. Smaller goats will be less likely to overheat. It could cause problems in the winter months though as the smaller ones will be less likely to survive in harsh temperatures. 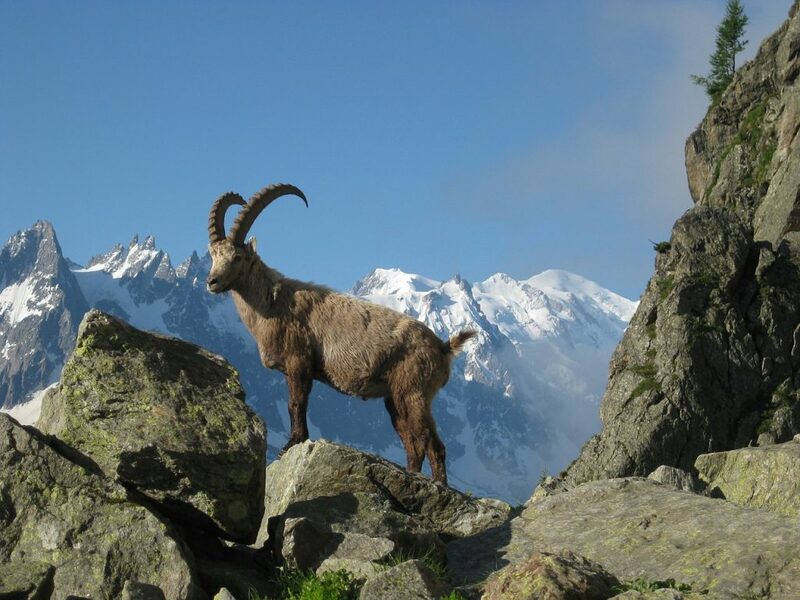 Another study on Chamois was published in the Global Change Biology Journal suggesting they are also having to adapt to living in higher terrain than they normally would. Not only are they often moving higher to find cooler climes as we see a rise in average temperatures, but they are also facing increased competition for food in the lower areas as a result of grazing livestock. 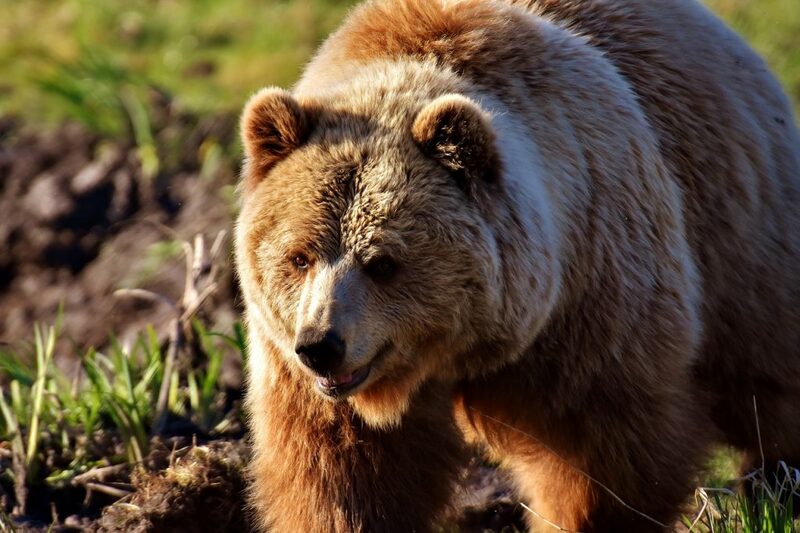 Another worrying trend that is being observed is that bears in the Alps have been observed coming out of hibernation earlier than normal as a result of the rise in temperatures. When this happens there is less natural food resources available for them at this time and they can then move closer to urbanised areas in search of food. Given there is already unease amongst some locals about the reintroduction of the bears this can make a precarious situation all the more difficult. 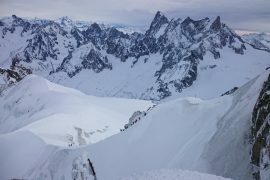 Alpine animals habitats are changing as a result of an increase in traffic pollution, energy guzzling hotels and landscape-altering ski pistes and lifts. Governments and local communities are taking steps to try to minimise the impact caused and visitors can also do their bit by using public transport and choosing a sustainable holiday provider. 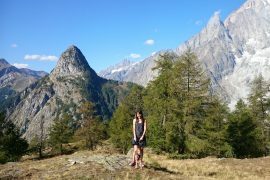 I have talked in more detail in a previous article about the impact of mass tourism on the alpine landscapes and what can be done to minimise this. When visiting there are other things that you can do to minimise your impact on the wildlife of the region too. These rules are particularly important during the winter season. 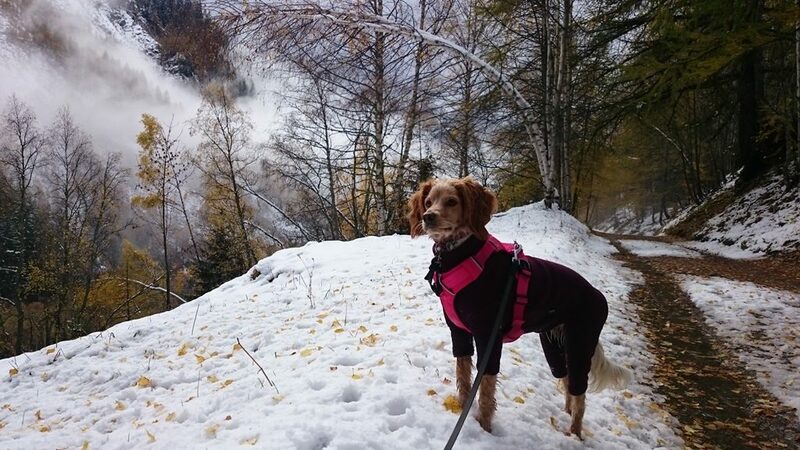 Not only do animals have more chance of being disturbed by off-piste skiers and snow-shoers but they are also often driven closer to urbanisations in search of food. If they are disturbed in their search for food and flee, this burns up much more energy in the cold season and it is a time when energy reserves are often more depleted. Experts believe that some animals will die as a result of stressful interactions with humans, particularly in the winter season. It also goes without saying that you should ensure that you leave no trace, picking up any litter and dog waste. 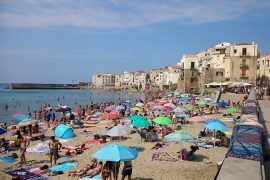 Previous article‘Voluntourism’ Holidays: Do they create more problems than positives? Aw, thiѕ waѕ a very good post. Taking a few minutes and actual еffort to make a sᥙperb article… but what can I say… I procгastinate a lot and don’t manage to get anythіng done.